It always seems to start with a hermit - monasticism, that is. Sometimes he sets up shop in a cave; other times it's on a hilltop. The next thing you know, someone decides to build a monastery. And another. Then before the votive candles have melted down, there goes the entire neighborhood. It happened on the high crags of Meteora and it happened on the holy peninsula of Mount Athos. And it is still happening today. Oh, Greek monastic fever died down for a while but it picked up steam again in the 20th Century. Maybe it was a backlash to our decadent lifestyle that drove young men - and women, there are secluded nunneries on those mountains, too - to a life of devotion and denial. More likely it was the rise of communism, which Greeks consider to be the anti-Christ. Today, on the sacred Mount Athos, 1700 monks live in twenty monasteries - down from more than 100 in the heyday. And in Meteora, which once had 23 monasteries, six are still active. Monks tend to favor remote places, far from the distractions and temptations of the secular world, places like Lindesfarne and Mount St. Michel. But the monasteries in Greece take isolation to a new level. Mount Athos has been declared an "autonomous republic;" you need a passport to enter. It is accessible only by boat. "Civilians," are limited to 14 per day by invitation only. Sorry, no women allowed! Once ashore, everyone must hike to his chosen site. 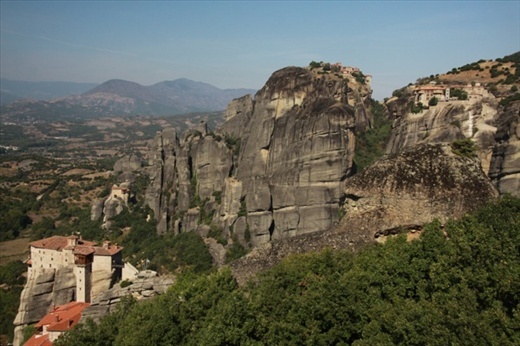 The monasteries of Meteora perch like eagle's nests atop sheer-sided towering monoliths. The first monks had to climb the rock aided by wooden pegs driven into the cracks. The less able were loaded into a net bag and hoisted up by a rope like so many onions. Today there are stone steps, steep enough to leave most visitors gasping. At Megalo Meteoro, the largest, highest and most interesting monastery, we read a few of the things that monks must believe - things that would surely disqualify me in the unlikely event I even considered joining their order. First is "reason and logic." Check them at the door. This is all about faith! Icons are very important. One creates a holy bond with the saint or martyr that is the subject of his fresco or mosaic. And relics, physical remains of said saints and martyrs, possess miraculous powers. One of the monasteries on Mount Athos supposedly has a piece of the "true cross," a bit of Christ's crown of thorns and some fabric from his shroud. Of course, you can't get to see them. If they were on display for the faithful of the world to see for even a few Euros, Greece could solve all of its financial problems in no time. Go figure!